Micaya White took home Big 12 Offensive Player of the Week honors once again (Photo courtesy of texassports.com). 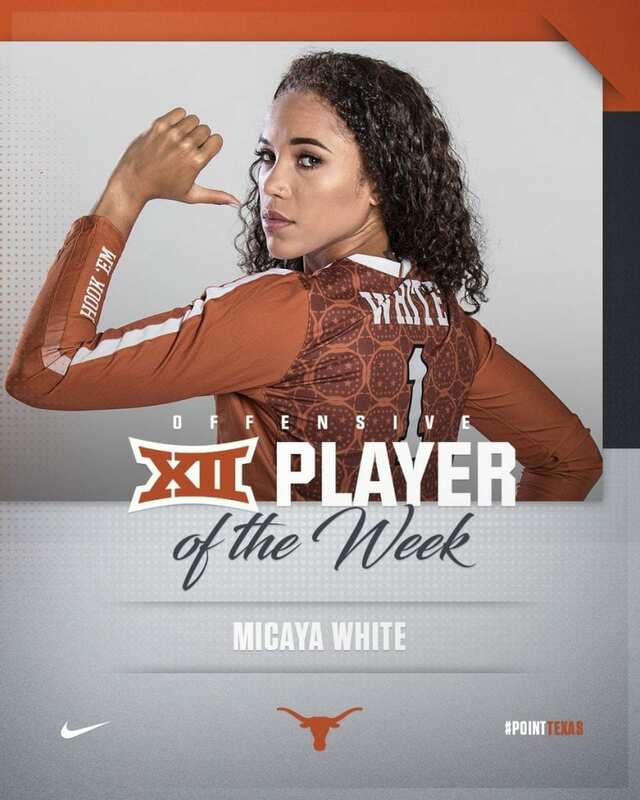 AUSTIN, Texas – Micaya White netted another honor while the Texas Volleyball team faces two tough tests this week. White earned Big 12 Offensive Player of the Week accolades for the second time this month as she led the Longhorns to a win over Texas Tech last weekend. The junjor outside hitter led the Longhorns with 17 kills on 26 swings with no errors to hit a career-best .654 in the win, and added 12 digs, one ace, and one block in the match. The award marks White's second of the season after being named Big 12 Offensive Player of the Week on October 1. Now, the Longhorns (12-4, 7-1) take on Iowa State (11-10, 4-4) on the road tonight at 8 p.m. live on ESPNU and streaming online. Then Texas returns home to face Oklahoma in front of a sold-out crowd at Gregory Gym on Saturday at 3 p.m. 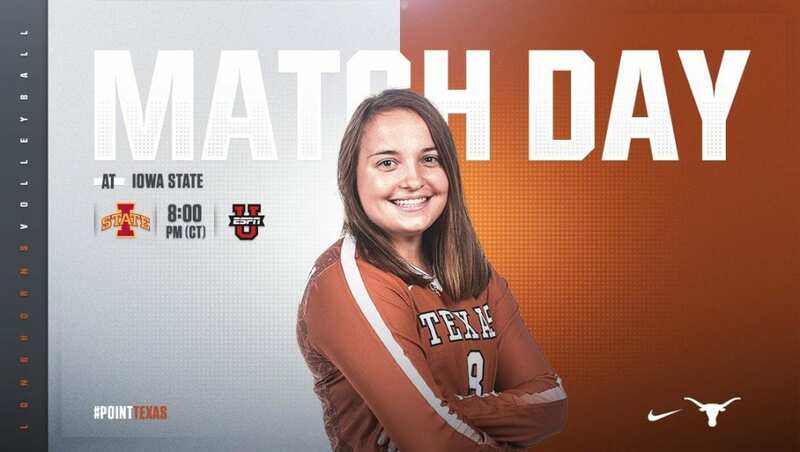 The Texas Volleyball travels to play Iowa State at the halfway point of Big 12 play (Photo courtesy of Texas Sports). The Horns moved into the Top 4 in the NCAA Volleyball RPI for the firs time this season with the victory as they look to close out conference play strong. Texas has the nation's second-toughest schedule after facing seven ranked opponents in the first 10 matches to start the season. 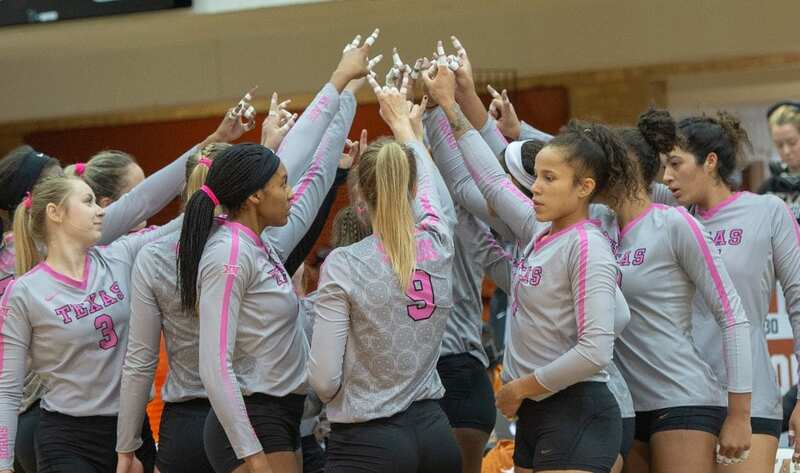 As they look to peak heading into November, the Longhorns hit their highest percentage of the season versus Texas Tech (.438) with 50 kills on 96 attempts and only eight errors. At the halfway mark of Big 12 Conference play, Texas is seventh in NCAA Division I in hitting percentage for the season (.290), led by freshman Brionne Butler at .366 (No. 44 in the country) with Morgan Johnson is not far behind at .355 (No. 71). Also at the halfway mark, White leads Texas in kills with 123 (3.97/set), hitting .328. Johnson leads in hitting percentage at .419, Shook has 325 assists (10.4/set), freshman Brionne Butler leads in blocks (40, 1.29/set), and Petersen leads with 116 digs (3.74/set). Texas has played 10 of its 16 matches away from home with a 4-3 record in true road matches and a 3-0 mark on a neutral court. The Longhorns have a 5-1 record in home matches, including four sweeps. On the road, the Longhorns are 1-1 in three-set matches, 0-2 in four-set matches, and 3-0 in five-set matches. For Saturday’s sold out match against the Sooners, fans may still be able to get their hands on tickets as a limited number of tickets may become available at the doors due to unclaimed student tickets. Texas asks that fans arrive one hour before the game for the best opportunity to purchase available tickets. The Texas Volleyball team is coming together heading into November (Photo by Jose Mendez/Horns Illustrated). Following that, tickets are still available for the remaining four home matches including the Wednesday, Oct. 31 match vs. TCU at 7 p.m. Due to high demand, fans who are looking to attend any remaining home matches are encouraged to purchase tickets as soon as possible by visiting TexasSports.com/tickets, calling Ticket Sales and Services at 512-471-3333, or purchasing in person at the Sandeep Soni Ticket Office in Bellmont Hall Monday-Friday, 9 a.m.-5 p.m.